Bay windows are a beautiful feature in any room, but with extra windows and angles to work around, dressing them with curtains can be a challenge. Ultimately it will depend on your personal tastes and how you plan to use the curtains day to day. So to help give you an idea, here are some things for you to consider when choosing your bay window curtains. Choosing the right length of material for your bay window curtains is a key decision. If your bay has a window seat or radiator below it, make the curtain length above or just below the sill to ensure the material does not gather or block any heat. While if the bay area continues to the floor, choose a full-length curtain drop like the design pictured here. Helping each curtain beautifully frame the window throughout the day with a luxurious effect. As bay windows project outwards from the rest of the room, a traditional curtain pole can limit how much material can move around the bay. Choosing a curtain track instead will allow the material to easily glide around each corner without any fabric catching or getting trapped. Another benefit of a curtain track is that your fabric will stay more uniform each time it is pulled across the window. With no need for curtain rings, sets of pleats can be hooked onto the track at even points, allowing it to hang elegantly whether tied back or fully drawn. While curtain poles can be tricky to work around a bay, they can also be that finishing touch to turn your new curtains into a feature. 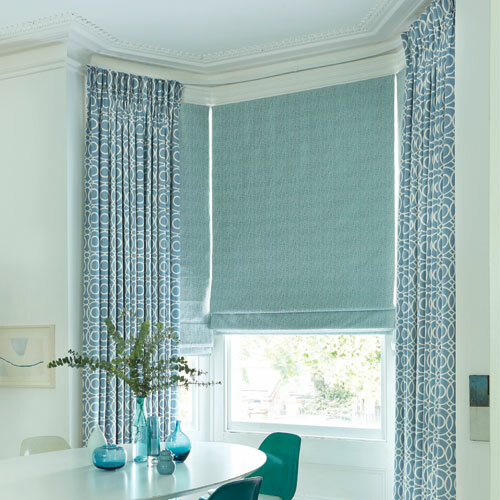 One option is to have individual curtains and poles for each window, which takes out the challenge of fitting the pole around the bay and is a great choice if you like the smart straight-lined appearance of eyelet curtains. But if you want the look of a curtain pole with the benefits of a track, your best option is to have a bespoke pole made to the shape of your bay window with passover curtain rings. These special three-quarter ring designs will enable each one to move around the curtain pole fittings without restricting the material. Perfect if you are interested in a more traditional pleated design that requires curtain rings. 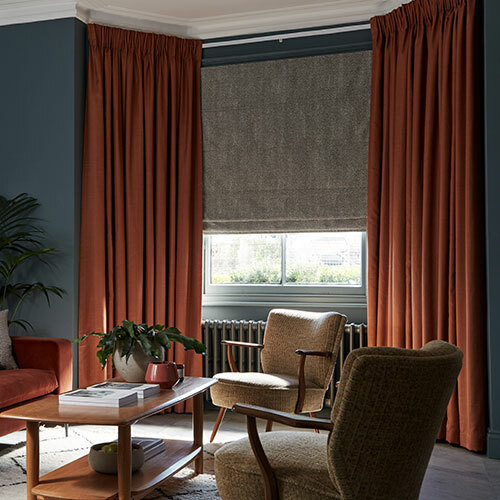 If you have your heart set on curtains but are not sure about having to draw them across the bay window every day, combining them with a custom-made blind could be your ideal solution. This then allows you to select a curtain fabric for more of a decorative feel as dress curtains. 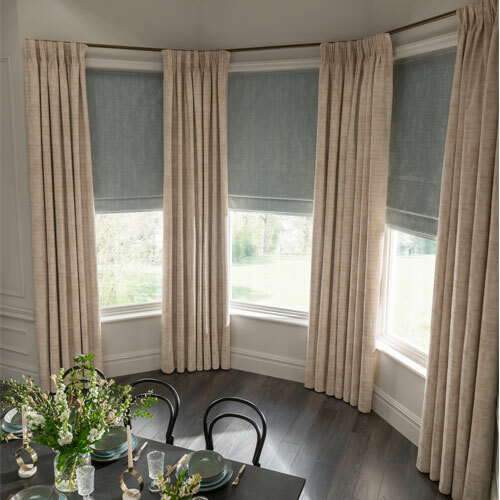 Complementing the style of your blinds, with the added option of pooling the material onto the floor for an indulgent look that works best with pinch pleat headings and more formal style settings.